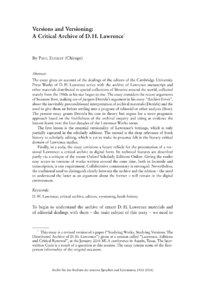 The essay gives an account of the dealings of the editors of the Cambridge University Press Works of D. H. Lawrence series with the archive of Lawrence manuscript and other materials distributed in special collections of libraries around the world, collected mainly from the 1950s as his star began to rise. The essay considers the recent arguments of Suzanne Bost, making use of Jacques Derridas argument in his essay Archive Fever, about the inevitably preconditioned interpretation of archival materials (Derrida) and the need to give them air before settling into a program of editorial or other analysis (Bost). The present essay grants Derrida his case in theory but argues for a more pragmatic approach based on the fruitfulness of the archival enquiry and citing as evidence the lessons learnt over the four decades of the Lawrence Works series. The first lesson is the essential versionality of Lawrences writings, which is only partially captured in the scholarly editions. The second is the deep relevance of book history to scholarly editing, which is yet to make its presence felt in the literary critical domain of Lawrence studies. Finally, in a coda, the essay envisions a future vehicle for the presentation of a versional Lawrence: a critical archive in digital form. Its technical features are described partly via a critique of the recent Oxford Scholarly Editions Online. Giving the reader easy access to versions of works written around the same time, both in facsimile and transcription, is one requirement. Collaborative commentary is envisaged. Nevertheless, the traditional need to distinguish clearly between the archive and the edition  the need to understand the latter as an argument about the former  will remain in the digital environment.